Tall hooped floral basket. Flowers include Lillies, Lysianths, Roses, Chrysants and other seasonal flowers and foliage. 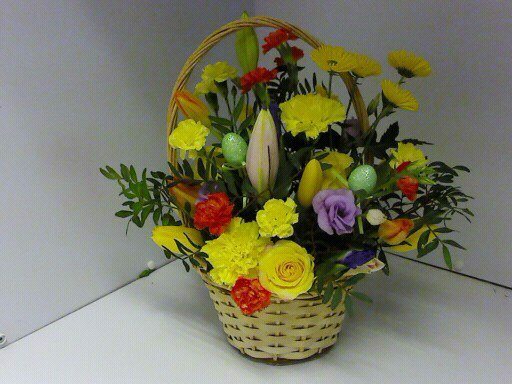 This wicker basket of cut flowers will really cheer someone up. Flowers are great for birthdays, Get well gifts, Anniversaries or simply to say thank you. This flower arrangement can be made in different sizes and colours. This floral basket of cut flowers well sit nicely on a side table to be well admired by everyone.